After a lazy breakfast, we point your toes toward woods and boardwalks and soft sandy Lake Michigan beaches. 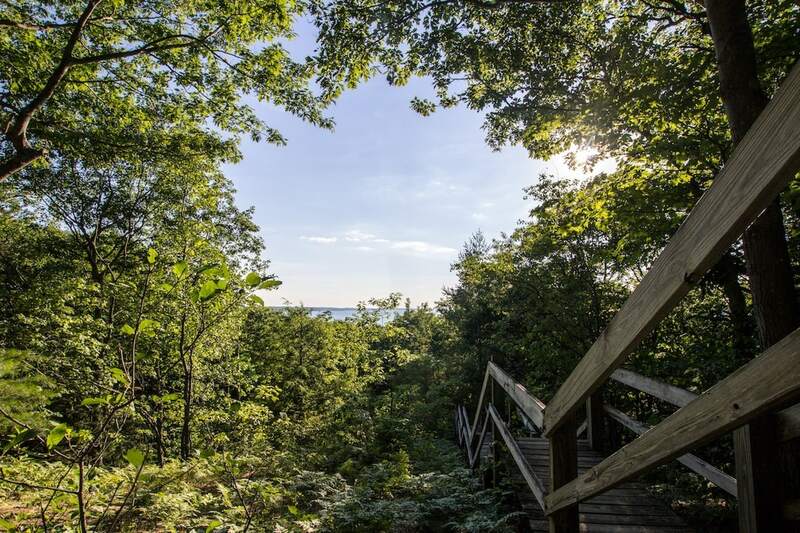 You’re going to love these trails in Petoskey and Harbor Springs. This story is featured in the September 2018 issue of Traverse, Northern Michigan’s Magazine. Get your copy. While technically a lunch spot (with brunch on weekends) Palette’s regular midday menu brings a breakfast A-game with the Bacon Benedict (made with locally sourced smokehouse delights from Plath’s Meats, going strong since 1913) and a fabulous Fried Egg BLT. A classic Bloody Mary with all the accoutrements and a shady spot on the patio with peeks of Little Traverse Bay takes it to a sublime next level. Open daily for lunch at 11:30 a.m. with brunch and Bloody Mary bar at 10 a.m. on weekends. Take a customizable hike along the park’s lovely trail network, through 304 gorgeous acres. This expansive, sugar-soft beach on Little Traverse Bay is a slice of heaven for rock hounding, playing beach volleyball or just listening to the waves come in. Don’t miss the incredible views atop Old Baldy: just follow the half-mile hiking trail to the top of this stable, nearly 800-foot-tall sand dune perched just behind the beach. Elegant alcoves invite you to take your time with a delightful array of breakfast classics enhanced by European ingredients. Do a DIY morning power-up with the European breakfast board: warm baguette, St. Dalfour French jam, European cheeses and plenty of protein—smoked salmon, ham, Canadian bacon, and a hard-boiled organic egg. 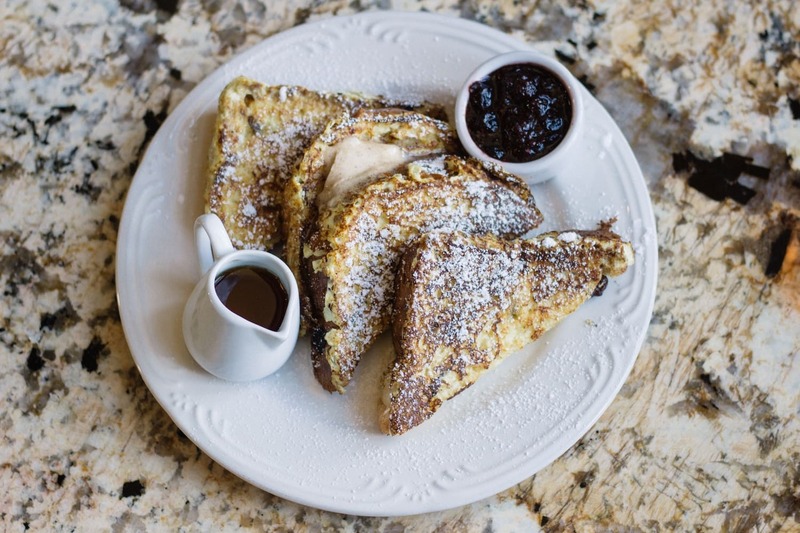 Also don’t miss the challah French toast with Kerrygold butter (hand-whipped with cinnamon and brown sugar), and berry compote, even if it’s a communal order shared with your tablemates. 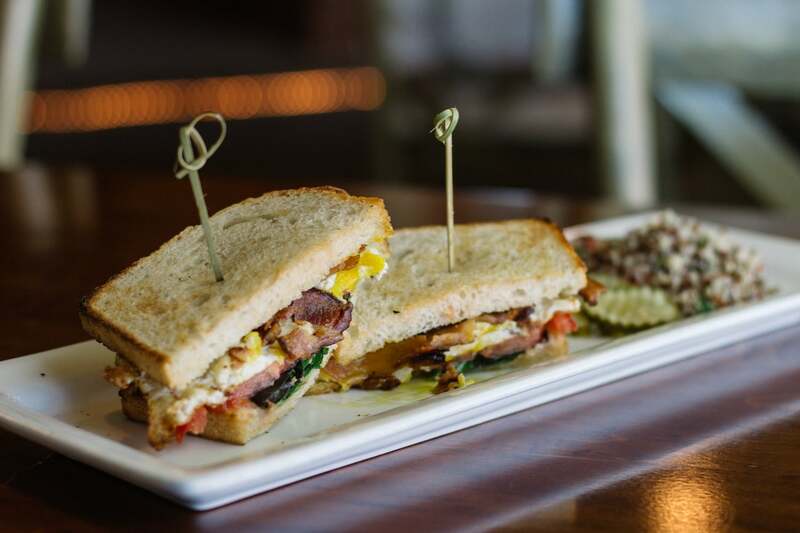 Breakfast is served Thursday through Tuesday, 8 a.m. to 3 p.m.
Bring your field guide along with your beach chair, as this diverse terrain is an eco-identifier’s heaven. Enter Wilderness’s mix of thriving forest, meandering creeks, wildflower meadows via the shore-hugging Wilderness Park Drive. Pick up a map and head to Big Stone Trail, an easy hike under a woodland canopy. At trail’s end is a quiet pond where great blue herons wade, pied-bill grebes dive and monarchs dance in the milkweed. Broaden your nature knowledge on the pond’s interpretive trail, then head back to the trailhead. 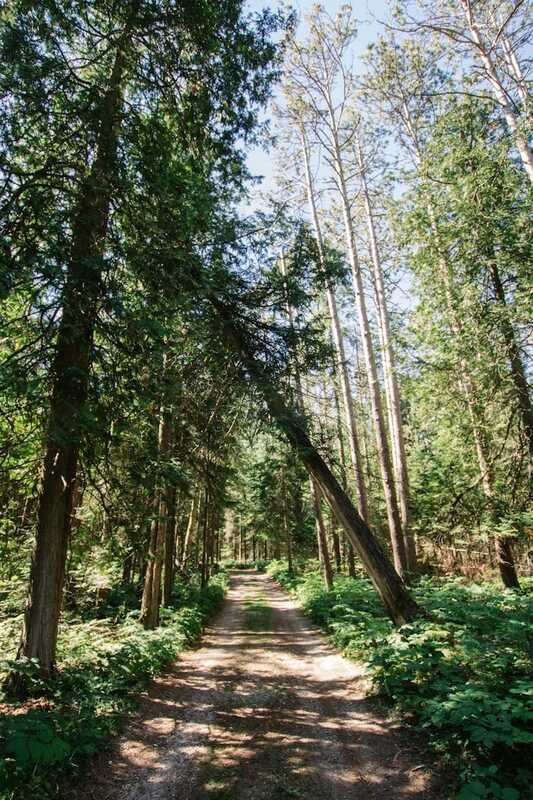 If you’re looking for more legwork, veer off to the 1 1⁄4-mile Red Pine Trail, which links up with several additional trails. Hop back in the car to continue your cruise toward the western edge of the park. Wilderness Park Drive turns into Waugoshance Point Road. Where it ends, park, then hit the beach. If you’ve got time (hope you do! ), consider strolling the shore to its western end at Waugoshance Point; from there you can see the Waugoshance Lighthouse, one of the first lighthouses on the Great Lakes. Before dusk, drive east to Big Stone Bay—a choice spot for a much-anticipated sunset dip in Lake Michigan. Find a spot near the sunny awning, and bask in the morning breeze and owner Susan Muer’s delectable creations. Muer is a phenomenal baker, so bread here is definitely not an afterthought, whether it’s homemade blueberry loaves or her family’s out-of-this-world Muer Bread, crusty and cloaked in just the right amount of salt and poppy seeds. 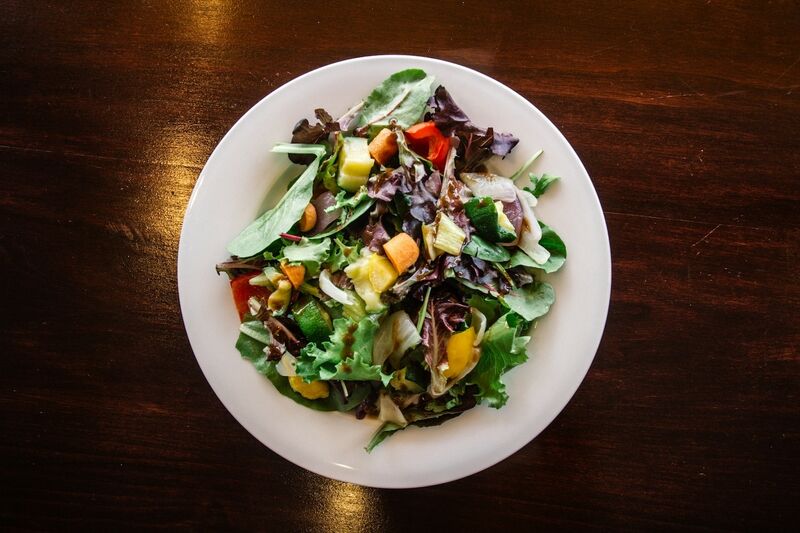 Start the day off fresh with the Breakfast Salad—spring greens, dried cherries, walnuts and feta cheese in the house maple raspberry vinaigrette, or if you are a bit later to brunch, the Roasted Vegetable Salad with goat cheese and balsamic dressing on the lunch menu is a rising star. Open for breakfast daily at 9 a.m. 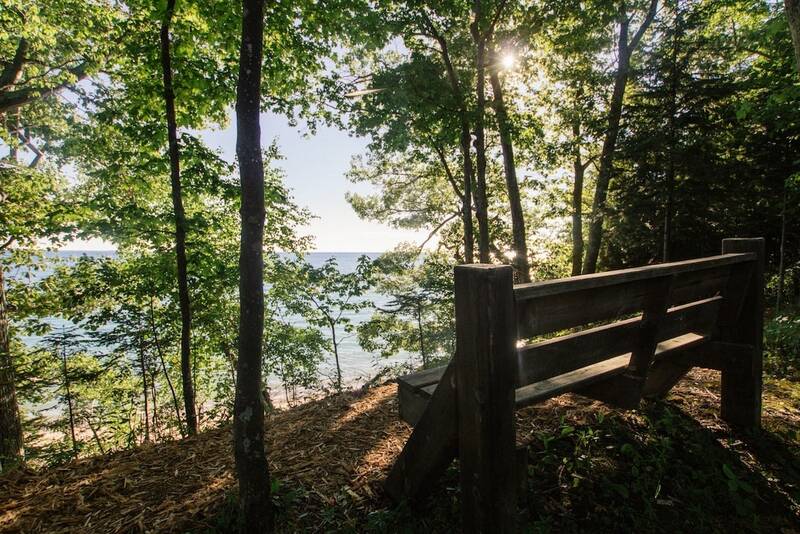 This sweet Lake Michigan spot is a bit of a secret, a pretty 30-acre preserve tucked away in the forests off M-119 four miles north of Harbor Springs. Strike out on the Cedar Trail to the shore. The route is easy—a half mile of boardwalk and mulched path. Maple, ash, tamarack, dogwood and juneberry trees mix with trickling streams and make for one of the best birding spots in the region. Stop, look and listen as long as you’d like. When you’re ready, continue down the path to the beach. Large boulders sit at the shore’s edge and speckled alder and chokecherries ring the beach. Do some stone skipping and/or afternoon napping on the preserve’s 300 feet of public frontage. On weekdays in September, chances are you’ll have it all to yourself. Jenny Jenness, Lynda Wheatley + Emily Tyra are all writers based in Traverse City and strong believers in beach days. // Rachel Haggerty is a student at Northern Michigan University and was a photography intern with Traverse. She is a South Lyon native whose favorite Michigan spot is Echo Lake Nature Preserve in the U.P. Click the cover to read the Petoskey area Vacation Guide.